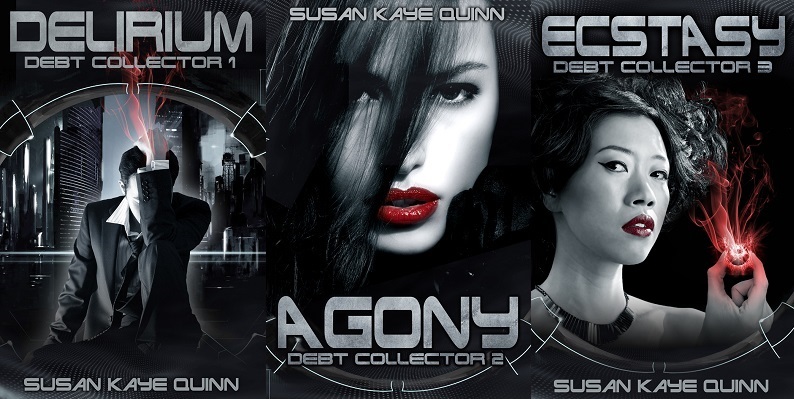 EPISODES 1-3 (Delirium, Agony, Ecstasy) of the Debt Collector serial. Contains mature content and themes. For young-adult-appropriate thrills, see Susan's bestselling Mindjack series. A serial is a series of episodes - or short stories - that are connected to tell a larger story. Must Read TV Serials are actually a lot like a TV series, which themselves vary a lot in type. Series like Law&Order and House are more self-contained, with only a few character storylines carrying over from episode to episode. Series like Lost or Heroes would be difficult to watch out of order because the storylines carry more strongly, sometimes with cliffhangers, sometimes not. Some readers like the week-by-week suspense of Must Watch TV; others would rather wait until the season is done and get it from netflix so they can watch it back-to-back. Likewise, some readers enjoy the suspense of reading a serial episode-by-episode as they're released. Others would rather wait until the entire serial is complete and read it all at once. Either is fine! Is a Serial a New Idea? Ebook serials are a new thing, because ebooks are a new thing - but serials have been around since Charles Dickens wrote and released Great Expectations (self-published through his own literary magazine!) in 6,000 word "installments" every week for nine months. Readers today aren't accustomed to reading in serial format because publishing serials was restricted to magazines, which didn't have wide circulation. Now with ebooks, the cost of transmission is low and the distribution is wide. Ebooks have revived the short story form! But for readers raised on novels, who crave longer works and more in-depth stories, serials are the next natural step. Is a Serial a Novel Cut Into Pieces? No. A serial is not a chopped up novel, just like a TV episode is not a chopped up movie. It's a different way of telling stories. In a way, it's more demanding to write than novels - you need to immediately draw the reader in, you have to reach some kind of reader-satisfaction-level by the end of the episode (even if you have a cliff-hanger), and you have to maintain that pace and storytelling arc over multiple episodes. But all that hard work on the part of the author makes it (potentially) more enjoyable for the reader. Can You Name Some Successful Serials? Yes! Hugh Howey's Wool RaShelle Workman's Blood and Snow Platt &Wright's Yesterday's Gone These are all recent bestselling serials that drew audiences in and helped revitalize the serial form. Why Would I Read a Serial? Readers tell me that they're enjoying the short episodes - they can read them quickly over lunch or in an evening and get a full "story" worth of entertainment. The fast pacing means there's a lot of story packed into a short number of words. Readers also say they enjoy the anticipation of finding out "what will happen next" much like a TV series where you get invested in the characters. Think about how a favorite TV series will sometimes focus one episode on one character or another, diving into their backstory. As a writer, I like that I can go in-depth a little more in each "episode" than I could in a novel, giving a richness to the story and characters that might be more difficult to do in a novel format. All serials eventually come to an end, just like a "season" of your favorite TV series. Whether you enjoy reading serials as they release, or want to wait until the complete season is out so you can read the episodes back-to-back, serials are a fast-paced, exciting way to enjoy a story. As a writer, I find serials are the hardest writing I've ever loved. 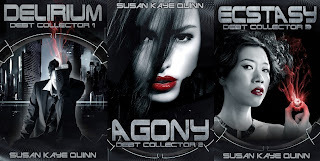 Susan Kaye Quinn is the author of the bestselling YA SF Mindjack series. Her new Debt Collector serial is her more grown-up SF. Her steampunk fantasy romance is temporarily on hold while she madly writes episodes to keep Lirium (the titular Debt Collector) happy. Plus she needs to leave time to play on Facebook. Susan has a lot of degrees in engineering, which come in handy when dreaming up dangerous mind powers, future dystopias, and slightly plausible steampunk inventions. Mostly she sits around in her pajamas in awe that she gets make stuff up full-time. You can find her at www.susankayequinn.com What's your life worth on the open market? A debt collector can tell you precisely. 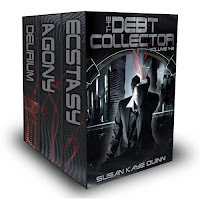 Delirium (Debt Collector 1) is now available on Amazon, Barnes&Noble, Kobo, iTunes, Smashwords. See the Debt Collector website to check all the latest episode releases and goings on in the Debt Collector world. Looking for a great mother's day gift? ?